Whether you're looking for your next big catch or prefer to spend a few hours taking in the views of beautiful Lake Michigan shoreline, these packages and upgrades are sure to provide a memorable day on the water! fish or cruise the ludington coast! Please call us to schedule and book the charters or tours outlined below. Early Morning Fishing Charter (May 1 - Labor Day, pending availability) - $550 plus a 2-night stay at REDUCED RATE with The Lamplighter Bed & Breakfast. 5 hour fishing charter (5AM - 10AM) with Captain & Crew from Hiatus Charters on 'The Hiatus' (31' Pursuit Express with the reputation of being one of the best fishing vessels among fresh and saltwater anglers). Made fresh 'to-go' breakfast including hot sandwich, baked goods, fresh seasonal fruit and a thermos of coffee to take on the morning of your fishing excursion. Mid-morning Fishing Charter (May 1 - June 30, pending availability) - $450 + 2-night stay at REDUCED RATE with the Lamplighter Bed & Breakfast. This package is perfect for those who don't want to be up before dawn (traveling with kids aged 10 & Up and/or spouses/partners that would like to join the adventure!). 4-hour fishing charter (8AM - Noon) with Captain & Crew from Hiatus Charters, on 'The Hiatus' (31' Pursuit Express that has the reputation of being one of the best fishing vessels among fresh and saltwater anglers). Coastline Tours (June 1 - September 30, pending availability) - $225 + 2-night stay at REDUCED RATE with the Lamplighter Bed & Breakfast. Enjoy the views of Ludington's beautiful coastline from the comfort of 'The Hiatus' - a 31' Pursuit Express that boasts a wide-open deck for a comfortable, stable ride. Enjoy a $30 gift certificate to Biercamp Market where you can select from their impressive collection of wine, craft beer and delicious cheeses and appetizers. Scenic Sunset Sail (June 1 - September 30, pending availability) - $230 + 1-night stay at REDUCED RATE with the Lamplighter Bed & Breakfast (call and request reduced rate associated with Coastline Tours). 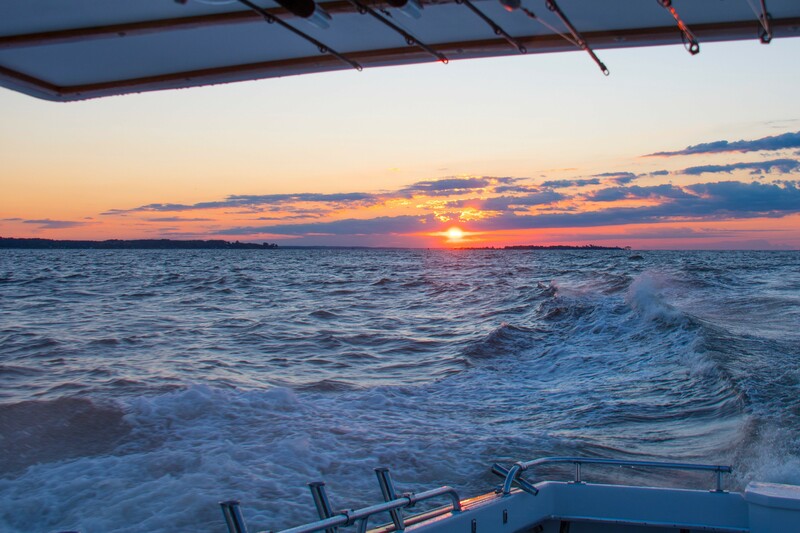 View the beauty of a Pure Michigan sunset from the deck of Reel Obsession Charters' 10 Meter Trojan International. Head out on Lake Michigan to enjoy the final rays of sun as you tour our beautiful coastline. Includes a $30 gift certificate to Biercamp Market where you can select from their impressive collection of wine, craft beer and delicious cheeses and appetizers.